BUSINESSES ARE NOW MORE POWERFUL THAN GOVERNMENT. A powerful book to document and support social responsibility and environmental awareness among successful leading 21st century businesses. Bruce Piasecki wrote World Inc. for Sourcebooks in 2007. Since he has consulted with hundreds of firms on the principles of responsibility evident when multi-nationals have become larger than most governments. For more on those services, and training workshops, please visit www.ahcgroup.com. After appearing in Japanese, Korean, Italian, Greek, Portuguese, and other languages and editions, World Inc. was reprinted in an updated paperback edition by Sourcebooks, available on Amazon and most stores, under the title The Surprising Solution: Creating Possibility in a Swift and Severe World. Here you will find the original website for World Inc., with its excerpts, endorsements and media reviews. We keep it here since it has become a hub of learning for many seeking to learn how to compete in a world dominated by social response capitalism. In fact, a number of nations now use social response capitalism as their operating model. "This book should be on every decision-maker's desk." "Bruce Piasecki has spent his career bringing people together to discuss the challenging issues of the times..."
"In his optimistic account, Piasecki, an environmental consultant, identifies a new consumer expectation: that corporations have social obligations.... Piasecki provides some insight into a successful corporation's shift toward social response capitalism through innovation and leadership.... Each of its three sections is fodder enough for a book." "Capitalism is in the midst of a profound transformation...What Bruce Piasecki sees will surprise and inspire you." "In his book, World Inc., Bruce Piasecki explores the changing role of business in the 21st Century, and the strategy of business sustainability as a source of inimitable competitive advantage." Welcome to the most important and underreported business story of this century — one that has been going on for years, and that will dictate the future of how companies profit and societies advance: As power moves into the hands of business, the world is increasingly looking to corporations instead of government or religion to solve its problems. The corporations that can best address social issues by creating superior products will thrive and profit in this new world. "...should be read by all consumers and corporate managers..."
"...one can only hope [the world's economies] will reflect and build on some of the principles and practices articulated in this book." "A must-read for those interested in moving to the top, or staying there..."
51 of the 100 largest economies in the world are corporations. 40 percent of global commerce takes place between corporations. Each of the six largest multinational corporations have annual sales revenues larger than the gross domestic products of all but 21 nation-states. The result? When it comes to solving social and global problems, businesses are more capable and powerful than government. The astonishing increase in the size and logistical scope of a few key companies defines today's corporate world — and the great opportunity awaiting forward-looking business leaders. For with new levels of wealth and power come new possibilities and responsibilities for social change. 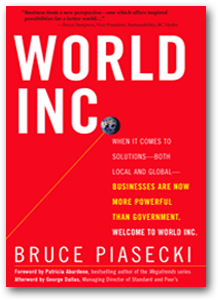 World Inc. is a groundbreaking new book by Bruce Piasecki, one of the top energy and environmental consultants to companies such as Toyota, BP, Chevron, DuPont, and Dow Chemical. In this book, the author shows how products designed with financial, social, and environmental values create better profits and make the world a better place. Using examples from his 25 years of work with corporate leaders, he describes how "social response" will be the new benchmark by which corporations will be judged and can drive profits. World Inc. is a glimpse into the near future. Those who embrace and excel at social response will be the business success stories of our time. Those who do not, do so at their own peril. World Inc. includes a Foreword by Patricia Aburdene, author of Megatrends 2010 and the multimillion selling Megatrends series. She has identified "conscious capitalism" as one her eight megatrends for the coming years. The Afterword was written by George S. Dallas, Managing Director and Global Practice Leader for Corporate Governance at Standard & Poor's. Like E.F. Schumacher's Small is Beautiful, this book will become a catalyst for a new values-centered vision of business. Bruce Piasecki is a media-savvy author who has appeared on numerous TV and radio shows promoting his five previous books. He has begun a multi-city international author tour for World Inc.
Bruce Piasecki's page on the Premiere Speakers website. Social Leaders and Business Leaders: Cut from the Same Cloth? Foreign Editions of World Inc.
© 2006–2014 Bruce Piasecki. All Rights Reserved.